Scalr needs access to your Cloud Platform(s) in order to provision and manage infrastructure on your behalf. To achieve this there is configuration work to do in both AWS and Scalr as follows. Add AWS credentials to Scalr and link to Environments. If you need assistance creating an AWS user and the required policy please refer to AWS Identity and Access Management Documentation . Before creating access keys and connecting Scalr to AWS there are some configuration considerations that may need to implemented to ensure Scalr can connect to your instances in AWS. You will need to create or configure an AWS VPC to work with Scalr. Every AWS user has access to the EC2-Classic network but this network is shared with all other customers in the region and is typically NOT an acceptable network for most use cases. If you need to create a VPC for Scalr and the Scalr managed instances please refer to Amazon Virtual Private Cloud Documentation . You will also need to perform some additional configuration work to ensure that Scalr can connect to your AWS instances. There are three options for this. All your managed instances are in the same VPC as Scalr. You have routing or peering connections to all the other VPC’s where Scalr managed instances reside. See VPC Peering Configurations for more details. Scalr supports detailed billing when using AWS. Detailed billing will give you more details than just showing the total price for compute. To enable detailed billing, you need to activate it in AWS and enter required details into Scalr. Even if you might have detailed billing enabled in AWS already, you must follow the instructions bellow to make sure the reports from AWS get generated in the correct format that Scalr needs. Please note that the billing details will be processed with a 8-12 hours delay. This isn’t a Scalr delay, but rather AWS posts updated billing information every 8 hours. As soon as it is posted, it becomes possible for us to process it and include in our reports. If you enable detailed billing, custom Pricing List entries for AWS will be ignored as AWS will be providing the final cost (usage) that we report against. To add sub-charges with detailed billing enabled you must use Markups. You will need to create an S3 bucket to store the billing files. Please refer to AWS Billing and Cost Management - Getting Started - Step 2: Turn on Reports for details on creating the S3 bucket and setting permissions. Open the profile menu in the top right and click on My Billing Dashboard. Click on Preferences in the left menu. Make sure Receive Billing Reports is checked. Enter a S3 bucket name to store your reports in. Click on Verify to make sure the bucket exists and has correct permissions. Make sure that Detailed billing report with resources and tags is checked. Click on Manage report tags. Make sure that scalr-meta is Active and click Save. If scalr-meta is not present, ensure that you have launched at least one Farm Role in order for Scalr to create the correct tags for AWS resources. There will be an 8-10 hour delay on initial billing details processing. For Scalr to work with AWS we recommend creating/using an IAM User that has at least these minimum permissions set. 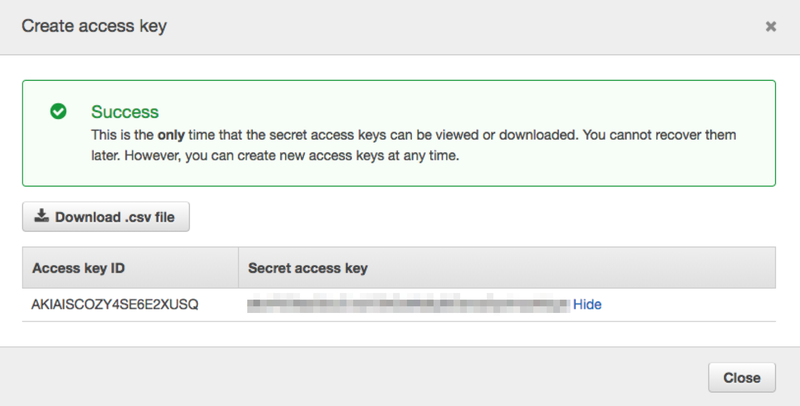 First you need to create and obtain the required access keys from AWS IAM. Navigate to Users, select the user to use with Scalr and click on the “Security Credentials” Tab. Click on “Create Access Key” and copy the Access Key ID and Secret Access Key. Check “Enable Detailed Billing” if you require Scalr to collect detailed billing information for Cost Manager/Analytics. Enter the region and S3 Bucket name previously configured in AWS.